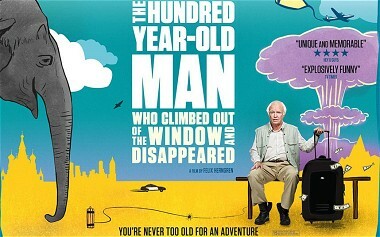 The 100 Year-Old Man: The Year's Best Film? The best picture of the summer (and, perhaps, this year) probably isn't playing at a cinema near you. But if it's anywhere within reasonable driving distance, be sure to catch The 100 Year-Old Man Who Climbed Through a Window and Disappeared. It's a hysterical delight and its lengthy title doesn't even come close to being the most unorthodox thing about it. The film appeared in Sweden in 2013, made a splash at a few North American film festivals last year, and is now in limited release–mostly in the few remaining "art" houses in the U.S. and Canada. It involves, among other things: blowing up stuff, eugenics, Franco, failures to communicate, the Manhattan Project, Stalin, the Cold War, an elephant, a Skinhead motorcycle gang, a man with over 600 college credits but no degree, a suitcase filled with money, and the eponymous centenarian. One might say that The 100 Year-Old Man is what you'd get if you allowed Jean-Pierre Jeunet (Delicatessen, Amelie, City of Lost Children) and Wes Anderson (Rushmore, Moonrise Kingdom, The Grand Budapest Hotel) to follow Woody Allen's Zelig into his dotage. This film features the dark humor and surrealistic touches of Jeunet, the zany caper-driven arc of Anderson's films, and the Everyman at the center of path-breaking events set-up of Allen, yet it's far more than a pastiche. Any attempt to describe the film's narrative is bound to disintegrate into incoherence, yet one of the film's numerous charms is the manner in which seemingly impossible and ridiculous situations have both an internal logic and mesh to deliver a satisfying denouement. (The lack of such resolutions has long been my reservation with Anderson, a director who delivers hilarity but often has no idea of how to end a film.) Herngren's film opens with 100 year-old Allan Karlsson (Robert Gustafsson) being shuffled off to a "retirement" home after exacting rather extreme revenge on the fox that killed his cat. There's nothing wrong with Allan's mind, though, so rather than face a staged "party" in the home, he lowers himself from a window, makes his way to the nearest bus station, and buys a one-way ticket for as far as his pocket change will take him. Then the true fun begins. The movie grafts a present-day slow chase caper to a series of flashback vignettes that reveal parts of Allan's past. As you no doubt surmised, it's a checkered and bizarre one. All I will say is that Allan's greatest love has been dynamite and then you're on your own. Gustafsson, who is actually only 50, is superb as Allan, and Ivan Wiklands, David Wilberg, and Mia Skäringer are deliciously droll as companions Julius, Benny, and Gunilla. And, yes, there really is an elephant. I haven't laughed this hard in the theatre since I saw The Castle, and I'm not sure that even the Marx Brothers could have concocted a comedy this improbable that miraculously holds together, even though you'll be in pieces on the floor. There are downloads available of the Swedish release, the US DVD should appear soon, and you might be lucky enough to catch it an actual cinema. But however you see this movie, be sure that you do.